But, as Mark explains, it's a crimes of opportunity problem. If you leave something available to be stolen, it will be stolen. So the more difficult you make it for the bad guys, the less likely that you will ever have a problem. And that's why you see almost all homes in the area with razor wire on top of walls and locked automatic gates and bars on the windows. And an alarm system that sends armed private security guards to your house if there's a problem. So with the house secured, we walked to the station. Found it without a problem and bought our tickets from the kiosk. It cost R36 ($3.85) for the two of us to go roundtrip to downtown Cape Town and back. It's only three or four stops, but still it was very reasonable! And, that was for a first class ticket. We forgot that we should have bought just the regular class ticket. It's not really all that much cheaper, but the only difference is that first class has padded seats. For a short ride, it wouldn't have made any difference. One thing we wanted to get accomplished was our internet access. We're going to be in South Africa for two months or so, and we wanted our own cellular internet connection. We had bought a fairly cheap one in Namibia, but it wouldn't work in South Africa. Mark had given us an old one that he had and said that maybe one of the literally dozens of cell phone repair places could get it set up and working and we could just return it to him when we get back to Cape Town in late February. So we found one guy who sold us a new SIM card for R5 ($0.52) and even activated it for us. Then, we went to the VodaCom store where we bought 3GB of access for R295 ($31.00). Wouldn't know until we got home if it all worked! Cape Town city hall. This is the building where Nelson Mandela stood on the front balcony and gave a speech when he was released from prison. We were getting hungry for some lunch around this time, and Mark had shown us a nice looking spot the evening before. We went around I don't know how many blocks trying to find it. We know that we were so close, and yet for some reason we couldn't find it! 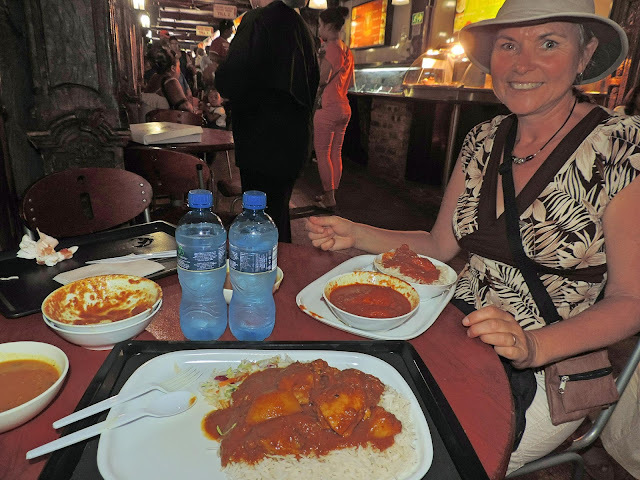 Eventually, we went back to the same East Indian food place that we had been to the night before. Good thing they have a large variety of items. Our lunch. For R85 ($8.95) we got two plates of food and two bottles of water. Didn't need much of a dinner because we were stuffed! It was a beautiful warm day, with a high of around 30C (86F). Lots of people out and about enjoying the day. Heading towards The Company's Garden. The Company's Garden is similar to New York City's Central Park. A green space that dates back to the 1650's that was originally fertile ground that was used to grow produce for the ships that brought the first European settlers to the area. It's not nearly as large as Central Park, but it's still a nice area where Capetonians can sit in the park and relax in the downtown core. Looking south from the Company's Garden towards Table Mountain. It didn't take long to waste away the afternoon just wandering around. By the time we made it back to the train station it was after 4:00pm. We were lucky that we didn't have to wait long for our train, and we were home before 5:00pm. Mark was out with some friends last night, so we made ourselves a salad and relaxed for the evening. And yes, our internet connection works great! We had a fun day in Cape Town...totally enjoying ourselves! South Africa has better internet coverage than the US. I used my Vodacom modem all over the country, including remote National Parks. Lovely park. Hope you're planning Table Mt. If you take the tramway, get there early. Or you might consider the two hour hike to the top and tram back down. Nice to know that the the coverage is good all over the country, one of the reasons we went with the Vodacom network which is slightly more expensive. We are definitely planning to hike up Table Mountain and possibly taking the tram back down. I wouldn't be surprised if we hike up there at least a couple of times. They have so many different trails going up there. The whole downtown section is definitely very clean, I think perhaps that some of the areas might not be so clean but that is the case in many cities. Love all the greenery and the mountains in the background - looks like a nice city! We are loving all the greenery. Namibia was wonderful but we have to admit that after two months we were starting to get tired of the desert. So far we think Cape Town is a very interesting place with lots to see and do. That is a real deal for internet. I wonder what tourists think when they come here from other countries about our two year contract crap and the costs for phones and monthly charges. But I guess they can charge what people are willing to pay. Looks like you had a great day after getting your business taken care of. You mention you might hike up Table Mt a couple of times. We suggest once is enough because there is too much to see in ZA to do things twice. Just cover as much ground as you can because the 2 month will whiz by. Great price for the internet. Is it a hot spot device you are using or a stick?